Right atrial enlargement occurs when the heart’s right atrium has increased in size. It usually signals a serious health condition. Here, we look at the causes, symptoms, and treatment options. The heart is made up of four chambers. Healthy heart functioning depends on proper coordination between these chambers. The chambers are called the left atrium and right atrium as well as the left ventricle and right ventricle. Heart valves transport blood from one chamber to another. Some people experience right atrial enlargement (RAE) and begin to experience a number of symptoms, including chest pain, while others find that the right enlargement is combined with enlargement of the left atrium. Either way, it is a condition that needs to be taken seriously. What causes right atrial enlargement? An enlarged right atrium has many complex causes. Most can be linked to other diseases and conditions. Below we outline a number of right atrial enlargement causes, but it is important not to jump to conclusions and self-diagnose. The following list is for educational purposes only. Anyone with signs of right atrial enlargement should seek medical attention for a proper assessment. Lung disease: Any lung disorder could lead to heart problems since the lungs play a vital role in normal functioning of the heart. Bronchitis or chronic obstructive pulmonary disease (COPD) can cause high blood pressure in the pulmonary artery. This high blood pressure can then cause right atrial enlargement. Tricuspid stenosis: The tricuspid valve sits between two chambers on the right side of the heart. When this valve malfunctions, it can lead to tricuspid stenosis. Basically, this means that the opening of the valve is partially blocked, decreasing blood flow between the two chambers. Tricuspid stenosis can put extra pressure, in terms of workload, on the right atrium. This pressure often becomes RAE. Mitral stenosis: The mitral valve helps manage proper blood flow between the atriums and ventricles. Any problems with this valve, such as narrowing, can cause right atrial enlargement. Often times, tricuspid stenosis can lead to mitral stenosis. Mitral stenosis is mainly caused by an infection called rheumatic fever. Rheumatic fever is linked to a strep infection. It is rare in the United States, but is still common in developing countries. Pulmonary embolism: This condition interferes with the free flow of blood between the heart and lungs. It is best described as a blockage in the pulmonary artery in the lungs that is caused by blood clots. These clots travel to the lungs from the legs or other parts of the body. It forces the heart to work harder to try to improve blood flow in the pulmonary artery. Pulmonary embolism is life threatening but quick treatment can reduce the risk of death. Tricuspid regurgitation: This condition occurs when the right ventricle does not close after it is full of blood and the blood starts moving back towards the right atrium. The excessive pressure from the blood flow reversing can lead to right atrial enlargement symptoms. Mitral regurgitation: The mitral helps regulate blood circulation between the right and left ventricle, but if the mitral valve doesn’t close after the left ventricle is full, blood can potentially flow in the opposite direction, leading to right atrial enlargement. Right ventricle hypertrophy: This is a disorder of the heart that includes thickening of the walls of the right ventricle. Like some of the other conditions on this list, right ventricle hypertrophy can put a lot of strain on the right ventricle, leading to RAE. Congenital heart disease: When the heart does not develop properly during the nine months of pregnancy, it can interfere with normal functioning of the heart. Any deformity in the structure of the heart can disturb blood flow and eventually cause right atrial enlargement. Some causes of RAE, such as right atrial hypertrophy. can be prevented. But before we address how to avoid the diagnosis, let’s look at symptoms. A right atrial enlargement diagnosis is obtained using different tools. Plain radiographs, which is a simple medical imaging machine using X-radiation, can detect some signs of RAE. But since it is normal to have a little bit of variation in the shape of the right atrium, moderate enlargement isn’t accurately determined. Some features that might indicate right atrial enlargement on a plain radiograph include enlarged the globular heart, narrow vascular pedicle, enlargement of the right atrial shadow, curvature of the right atrial that is over 50 percent of the cardiovascular height, and a right atrial margin more than 5.5 cm from the midline. Right atrial enlargement radiology is just one test. A CT/MRI can also be used in helping diagnose right atrial enlargement. Usually, these tests can determine quality of the heart, tissues, and valves. Suggested measurements include looking at the long axis, short axis, an area of the right atrium. Right atrial enlargement treatment depends on the underlying cause. In some cases, surgery is needed to correct an abnormality. In the majority of situations though, treatment for right atrial enlargement focuses on regulating blood pressure to control any heart problems. This is why doctors commonly prescribe medications to control high blood pressure in those who suffer from right atrial enlargement. Avoid smoke or tobacco: Smoking or using tobacco is one of the biggest risk factors for developing heart disease. The chemicals in tobacco can damage the blood vessels and the heart. Carbon monoxide in cigarettes replaces the oxygen in the blood, which can lead to high blood pressure. Secondhand smoke can also cause a risk. Exercise regularly: Daily exercise can reduce the risk of heart disease. Physical fitness can help control weight and reduces the chances of getting other conditions, such as high cholesterol and diabetes, which could contribute to heart problems. About 30 minutes of moderate exercise every day is recommended. Eat heart-healthy: A healthy diet can reduce your risk of right atrial enlargement. The Mediterranean diet is an example of a heart-healthy approach, as it includes a lot of fruits and vegetables. You should also aim to eat low-fat dairy products and lean meats. Making fish part of your diet is also a good idea. Limiting salt and sugars in your diet can also go a long way in protecting your heart. Limit alcohol: While moderate drinking may be acceptable, more than this can lead to both physical and mental impairment. Moderate drinking is up to two drinks (4 oz. of wine, one 12 oz. beer, one oz. of 100 proof spirits, or 1.5 oz. of 80 proof spirits) a day for men, and up to one drink a day for women. Get sleep: Less than five hours of sleep per night can harm your health. Sleep deprivation puts you at risk for high blood pressure, obesity, type-2 diabetes, depression, and heart attack. Reduce stress: Stress can contribute to right atrial enlargement and even sudden heart attack. 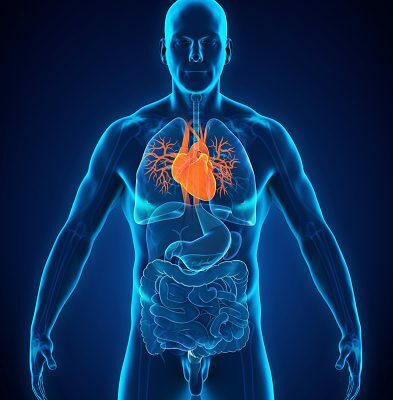 Anxiety, social isolation, and anger are known to impact our cardiovascular system. Meditation, yoga, and even nature walks are good ways to help reduce stress and anxiety. Maintain a healthy weight: More than two-thirds of adults in the U.S are overweight or obese. Both weight and shape can impact your health. For instance, fat around the middle can increase the risk of cancer, diabetes, and right atrial enlargement. Why? Well, because fat cells produce toxins that can damage the body. Get regular screening: Staying on top of your health by getting regular screenings is a huge part of prevention. Screenings can detect issues that can be addressed before they progress into something more serious. As you may have guessed, people suffering from high blood pressure have to think about improving their heart health. Currently, there are about 75 million Americans suffering from high blood pressure, and according to the Centers for Disease Control and Prevention, only about half have their condition under control. This means that many people are putting themselves at risk for right atrial enlargement and the complications that come with it. Related: Heart rate vs. pulse: Are they the same or different?